An unhappy Jose Mourinho criticised his Real Madrid players after a 1-0 defeat by Sevilla left them with four points from four games to trail arch-rivals Barcelona by eight early in the La Liga season. 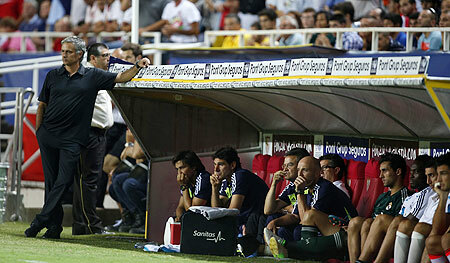 Real are not the only European big guns to make a stuttering start. AC Milan slumped to their second successive 1-0 defeat at their own San Siro stadium, this time against Atalanta, and have taken only three points from their first three Serie A games. Real Madrid's stuttering start to the domestic campaign continued when they lost 1-0 at Sevilla to slip eight points behind leaders Barcelona, 4-1 winners at Getafe. Sevilla midfielder Piotr Trochowski netted from a corner in the second minute of a bruising and bad-tempered battle at the Sanchez Pizjuan and Real coach Jose Mourinho blasted his players after the game for their poor performance. Lionel Messi came off the bench to score twice and help Barca maintain their perfect record under new coach Tito Vilanova, with Adriano and substitute David Villa netting either side of the World Player of the Year's double. Barca are top with 12 points from four games, two ahead of second-placed Malaga, 3-1 winners at home to Levante. Real have four points in 11th. The only 100 percent record left in the Premier League ended as Chelsea were held to a 0-0 draw at Queens Park Rangers in a match in which the main talking point was Anton Ferdinand's refusal to shake the hand of Chelsea skipper John Terry. 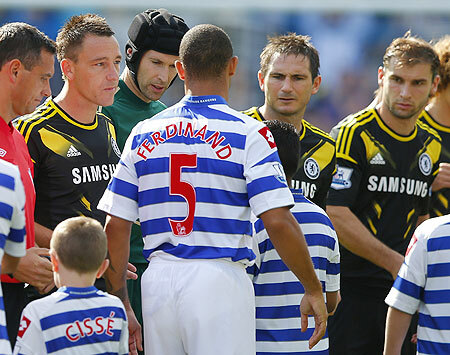 Terry was cleared in July of racially abusing Ferdinand in the same fixture last season. Manchester United moved into second place with a 4-0 thrashing of Wigan Athletic, Paul Scholes among the scorers on his 700th appearance for the club. Arsenal roared up to third with a 6-1 defeat of promoted Southampton who are still without a point, Gervinho scoring twice for the Gunners who benefited from two own goals. Champions Manchester City were held 1-1 at Stoke City. Andre Villas-Boas secured his first Premier League victory as Tottenham Hotspur manager when his side outclassed Reading 3-1 on Sunday with two goals from England striker Jermain Defoe. Gareth Bale made it 2-0 after 71 minutes with a scuffed shot from Kyle Walker's cutback and Defoe continued his hot streak with a superb solo goal, running from inside his own half to clip a shot across Reading keeper Alex McCarthy. Lazio, Napoli, champions Juventus and Sampdoria all won to maintain their 100 percent records after three games. Lazio, making an excellent start under new coach Vladimir Petkovic, won 3-1 at Chievo thanks to two outstanding goals by Brazilian midfielder Hernanes who was involved in the other goal scored by Germany forward Miroslav Klose. Juventus came from behind to beat Genoa 3-1 away and Napoli defeated Parma by the same score. Sampdoria saw off Pescara 3-2 but have only eight points as they started with a one-point deduction over the Calcioscommesse match-fixing scandal. A dismal AC Milan slumped to their second successive 1-0 defeat at the San Siro, this time against Atalanta, and AS Roma squandered a 2-0 lead at home to Bologna and were beaten 3-2. Bayern Munich and promoted Eintracht Frankfurt are the only teams with nine points from three games. Bayern maintained their 100 percent record with a 3-1 win over Mainz 05, Mario Mandzukic, Bastian Schweinsteiger and Toni Kroos scoring the goals, and Eintracht beat 10-man Hamburg SV 3-2. That defeat left Hamburg with no points, alongside Hoffenheim at the foot of the table. Champions Borussia Dortmund beat Bayer Leverkusen 3-0 with goals from Mats Hummels and Polish pair Jakub Blaszczykowski and Robert Lewandowski. Twente Enschede thrashed lowly Willem II Tilburg 6-2 to stay top and maintain their perfect start after five matches. Vitesse Arnhem registered their fourth straight win by beating Groningen 3-0 to sit two points behind the leaders, while Ajax Amsterdam beat RKC Waalwijk 2-0 to remain third. Utrecht had two players sent off but still stunned PSV Eindhoven with a 1-0 home win, PSV's second defeat this season.